The Ninja are known to be free of any fear, obstacles and problems the ordinary people can face every day according to old legends. The well–known western proverb says: “Practice makes perfect!” And that’s true and applicable to any sphere of life. Ninja should train a lot to get perfect in every activity they are skilled in. Ninja start training their body and mind from the birth. While any skill is honed, the others get a little bit more complicated and to the highest extent. Whereas the mission of Ninja was full of danger requiring special attention to survive, exacerbated instinct of danger sense and feel of life appeared as one of the most essential qualities. They had to foresee the opponent’s thoughts, actions and intentions to swiftly response to events. A Ninja with the instinct of the ordinary person was never deemed a specially trained authentic Ninja. Would you like to see in the dark like Ninja? Would you like to train to disappear in the air leaving smoke after? 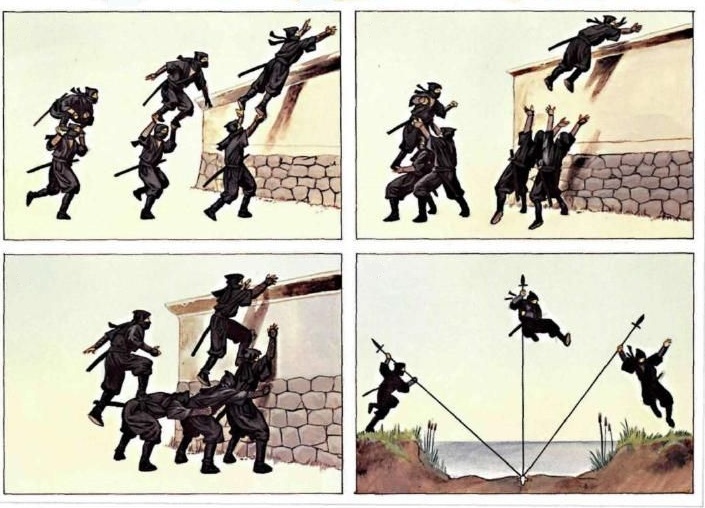 Are you really impressed by the skill of Ninjas to climb the walls at ease? It takes too long to train the things master Ninja can do. So, what are the secret of what they show to people& Are they different in anatomy? Different in mind? Never. It is just peculiarities of the training. 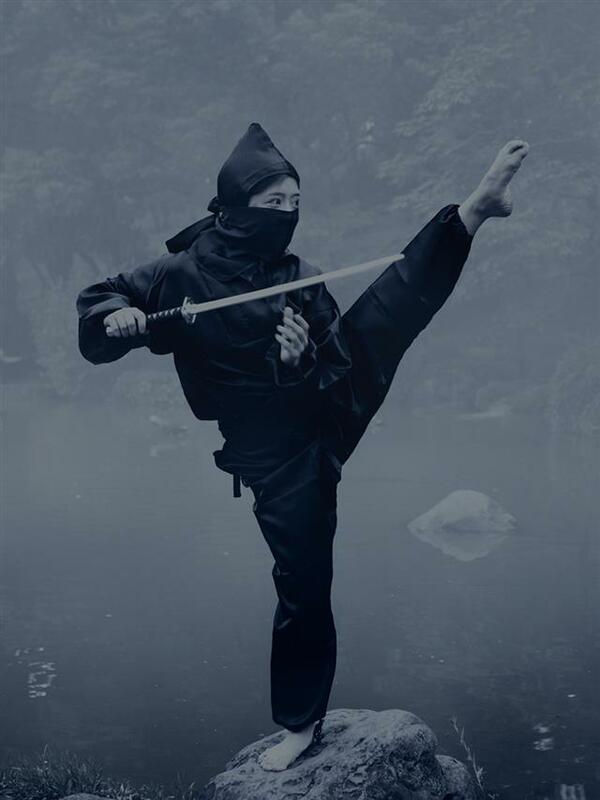 The sharpened perception of the environment the Ninja live in is the result of long-term trainings based on the meditation to relax from the outer world. Ninja usually start their day with meditation and they do lots of exercises on a daily basis with the key goal to foresee the opponent’s intentions and quickly respond to win. A warrior was not aware of the opponent party goals. But the outcome of the battle relied essentially on the skill of the Ninja to orient in the environment to make right conclusions and act accordingly. Training rooms were of great interest and popularity being specially equipped premises for Ninja. Only perfectly trained Ninja was able to pass through all the traps and devices set along the rooms. Only true Ninja was able to timely recognize and respond to the danger all the time moving towards the goal. The traps specially designed for Ninja were like the test to see whether Ninja was ready to pass through traps in the daytime and at night. Immediate response to non-human controlled devices required complete mental exinanition about ninja: while moving towards the set goal the Ninja should think of the goal but no other things should be there concerning him. Mostly Ninja trainings were based upon restricted unfavorable conditions and unpleasant environment when the warrior was attacked from everywhere. Such trainings helped Ninja to get used to stressfull situations responding quietly defending, though. Ninja training is the real life and such real environment trainings make the Ninja get prepared to react adequately and immediately to environment changes, using physical and mental capacities seeking for non-standard solutions out of extreme situations. Good eyesight is one of the vitally essential sense organs for the Ninja. Ninja should be able to see as an eagle even at nights. To reach this the Ninja employed simple exercises as slight tapping over the closed eyelids, rinsing eyes with cold water, and focusing at any of the stars in the sky for long time. 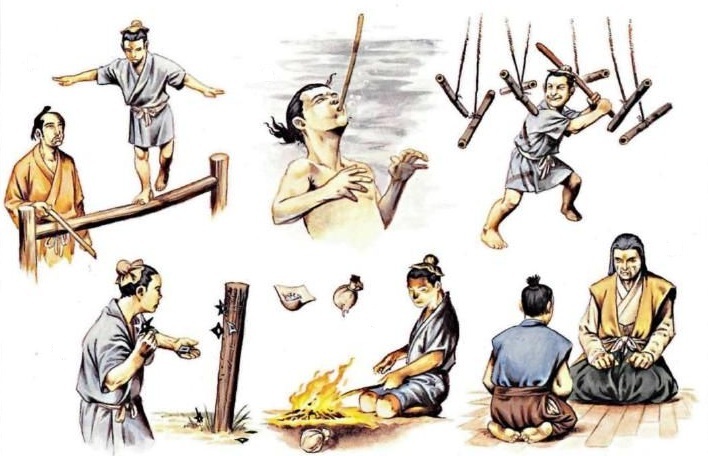 The Ninja were trained from early childhood to memorize items visually and sharpen the attention onto the environment. So, while crossing the lawn, the apprentice should memorize the site doing physical exercises. Eyesight training was the daily routine exercise for the Ninja and day by day they were trained to hone the seeing, watching and observing even invisible changes around them. One of the training exercises was devoted to examination of feelings and emotions of the other person. Partners used to sit down vis-à-vis and peering into each other’s face and eyes, they tried to identify emotions, feelings and the mood assessing eyes of the opponent, facial mimics and respiratory rhythm. Ninja used to wash auricles with cold water massaging them at the same time with the purpose to improve hearing functions. The Master Ninja should be skilled in separating particular sounds and recognize any sound alteration against the background sound. So, Ninja was able to identify the location of the enemy in distance, recognize if the person sleeps or pretends to sleep. Everyday training exercises for Ninja included exercises to hone sense of smelling. Exercises were made by slight tapping the nose and rinsing it with cold water to sharpen nose. Ninjas also practiced to guess the item by smell, in particular to select the specific scent out of lots of aroma. The Ninja was able to read the place as the book just smelling the air around. Taste and tactile sense were also used in Ninja trainings. Sharpening the sense of taste the tongue sensitivity increased. A good Ninja who mastered the skill of using tactile sense as the weapon was able to detect any movement of the opponent by the air motion with opportunity to stand against stronger attackers without less efforts. Ninja skills are always perfectly honed and among them the most appreciated is the skill to perceive the person with all physical qualities and feeling and even intentions. The capability to foresee emotions of the opponent was developed by special study. Physical drills and specially designed exercises involving no emotions and feelings, free from the internal attitude of the warrior were not sufficient to achieve the result owned by «night demons». This class Ninja revived and recovered their capacity and strength through spiritual perfection and daily physical tricky loads and intensified development of personal qualities made them perfect invincible warriors. As ninja should have been skilled both physically and mentally, the results of long jump was really impressive coming to about five and a half meters (5.5m), while the high jump reached two meters and seventy cm (2.7m). The training site sized three square meters and thirty cm was designed to work up such long and high jumps (3.3х3.3m). The platform is then planted with hemp seeds. The choice for the hemp is easy to explain: the hemp stems grow too fast to train in jumping every day. Since hemp grow every day adding more new stems the Ninja had to practice their jumping skills either, otherwise the stems will grow higher than the height the Ninja was used to take. Ninja had to take advantage of long years of training, industrious, intense and regular, to jump as high as 2.7m. So, the well-prepared Ninja spends most of his time training himself physically and mentally, mastering the ancient authentic art of Ninja fighting, forming the life concept.